Having previously burst onto the international scene in 1962 with Ivan's Childhood, for which he won the Golden Lion at the Venice Film Festival, Russian filmmaker Andrei Tarkovsky was faced with the task of choosing the follow-up to his impressive debut. When presented with the idea of creating a film based on the life of renowned Russian artist, Andrei Rublev, whose medieval religious icons have become one of the cornerstones of Russian art, Tarkovsky at first balked at the idea of making a historical epic. But when he realized that he would have almost complete artistic freedom since little is known about Rublev's life, he decided to undertake the project. The result was Andrei Rublev, a film of such monumental power and stature that it almost seems to stand apart of from not only film history, but from cinema itself. We would like to depart from the traditional dramaturgy, with its canonical completism and its formal and logical schematism, which so often prevents the demonstration of life's complexity and fullness. After all, what is the dialectic of the personality? Phenomena that a man encounters or in which he participates become part of the man himself, a part of his sense of life, a part of his character. Therefore, the events of the film must not be a backdrop on which the protagonist is imprinted. Often, films about people of art are constructed according to the following scheme: an event occurs, the hero observes it. Then the viewer sees him think it over, and then he expresses his ideas about the event in his works. In other words, Tarkovsky didn't set out to create a literal biopic, illustrating a cause and effect of the events surrounding Rublev and the icons he would eventually paint. Instead, Andrei Rublev presents us with a series of loosely connected (if it all) vignettes, some not even featuring Rublev, that set us squarely in the societal and spiritual milieu of medieval Russia. Tarkovsky uses these vignettes to illustrate the world that gave birth to Rublev's art, and the human brutality that inspired the artist to reach for the divine. These vignettes are filled with indelible images, paint spilling into a river, mud slung across a white canvass, naked pagans dancing in the moonlight, a violent raid on a peasant village, a man taking flight in a makeshift hot air balloon, itself a kind of metaphor for humanity's (and by extension, Rublev's) quixotic determination to get closer to God. And yet, what Tarkovsky has achieved here is something that almost defies words. The stark black and white imagery (stunning on the new Criterion Blu-Ray), accompanied by the hushed sound design with its wordless vocals and tolling bells, immerses us in a dream that feels at once sacred and profane. It's a meditation on art and faith, to be sure, but it's also a film that examines the human condition in memorable and often breathtaking ways. It's as if Tarkovsky managed to distill the creative process to its most carnal and holy elements and projected them onto a screen for the world to see. And we, as humble audience members, are all but helpless to its overwhelming power. Like art itself, Andrei Rublev is a vast, complex, almost unknowable work that nevertheless feels like it conveys some sort of universal truth that is just beyond human comprehension. 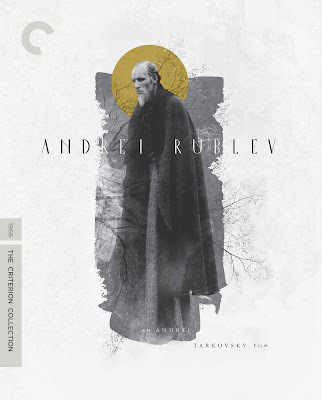 ANDREI RUBLEV | Directed by Andrei Tarkovsky | Stars Anatoliy Solonitsyn, Ivan Lapikov, Nikolay Grinko, Nikolai Sergeyev, Irma Raush, Nikolay Burlyaev | In Russian w/English subtitles | Now available on Blu-Ray and DVD from The Criterion Collection.